Rock Creek Park is missing some of its former plant and animal inhabitants whose presence helped shape the natural communities seen today. Certain other plants and animals that call the area home are rare, declining in population, or vulnerable to extinction. 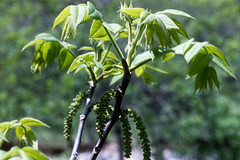 New spring growth of butternut (Juglans cinerea), producer of edible nuts. Photographer: Milo Pyne, courtesy of NatureServeSeveral plant species at Rock Creek Park are of special conservation concern—locally rare, threatened, or endangered (RTE). Most of these rarities are wildflowers and grass-like sedges. Five RTE species are trees, including butternut, a walnut-like tree that is becoming more elusive due to the spread of a canker disease. 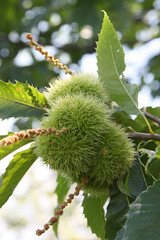 Another is American chestnut, previously abundant in the upland forests at Rock Creek, but now essentially absent since a non-native disease struck them nationwide in the early 1900s. Ecobit: Chestnut Sprouts: Phantoms of the Past Yet another is the flood-tolerant overcup oak, found commonly in the southeastern United States, but infrequently in the vicinity of Rock Creek Park because it is near the edge of its natural range this far north. 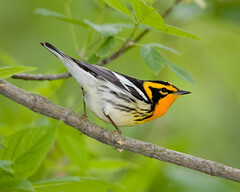 A male blackburnian warbler (Setophaga fusca) in breeding plumage. Photographer: Flickr user Laura GoochRock Creek Park offers habitat to several animals of particular conservation concern. Some plants and animals that used to live in Rock Creek Park have already become extinct, such as the Carolina parakeet. Some animals that haven’t been reported recently in Rock Creek Park are the marbled, four-toed, and northern spring salamanders. Why are these diverse species gone or declining? For ground nesting birds and other small animals, it may be the loss of critical understory shrubs and herbs to hungry deer. For larger animals, as wonderful as Rock Creek Park is, it’s simply not big enough to support large predators. American chestnut (Castanea dentata) was once a common canopy tree in the eastern U.S. but now rarely grows to maturity to produce fruit. In other cases, new diseases, environmental toxins, more frequent turbulent floods, predators or competitors, or even non-native invasive plants have sufficiently changed the environment so that these species no longer thrive in the Rock Creek area. fencing off some uncommon plants that are vulnerable to trampling and deer browse. You, too, can help rare, threatened, or endangered plant and animal species in Rock Creek Park—and other natural areas—in several ways. Keep your dogs on leash when hiking in nature, and stay on designated trails. Scrambling up and down slopes can destroy habitat and sensitive plants. Volunteer with Rock Creek Conservancy as they partner with the National Park Service. You can help park staff maintain and restore sensitive habitat by refraining from planting escape artists—non-native invasive plants—in your yard. Ecobit: Go Native. Or since your neighborhood probably does have non-native invasive plants in the landscape, you can encourage everyone to maintain those plants to keep them from spreading. Birds and squirrels, wind, and storm water can carry away seeds and other reproducing parts! Ecobit: Don’t Let Your Ivy Climb Never dump plant waste from non-native invasive plants in wooded areas! Why? Those roots, seeds, and other plant parts might just take root there! 2. U.S. Fish and Wildlife Service. 2007. Hay’s Spring amphipod (Stygobromus hayi). 3. The National Park Service Biodiversity Database. 2014. NPSpecies - The National Park Service Biodiversity Database. Secure online version. 4. The National Park Service Biodiversity Database. 2014. NPSpecies - The National Park Service Biodiversity Database. Secure online version.